Although it wasn’t busy that evening, probably less than half a dozen tables, it still took a few minutes after we arrived to be greeted and shown to a table. Perusing the menu it ran the gauntlet from Mediterranean to North American to everything in between listing such items like pasta, fish and chips, fries and pizza. We wound up having quite a few long waits that evening, including the wait between ordering our wine to getting it, then again between receiving our wine and actually ordering the food. Unfortunately the wine didn’t help the time pass by any faster as the house white smelled and tasted like vinegar, least to say I didn’t wind up drinking much of it. 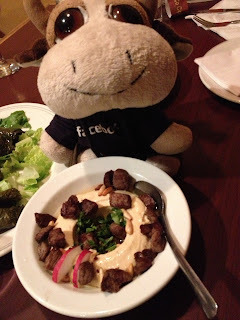 Our appetizers consisted of hommus pita dip topped with sirloin feeb and pine nuts, and served with pita bread. Only half of our appetizer actually hit the table and we wound up spending the next few minutes trying to flag down a server in a mostly empty restaurant to get the pita that was supposed to go with the hommus. The hommus was very thick and needed just a tad more seasoning, but was tasty otherwise. Meanwhile, the grape vine leaves stuffed with rice, parsley, mint, tomato, and onions was a decided flop at our table. 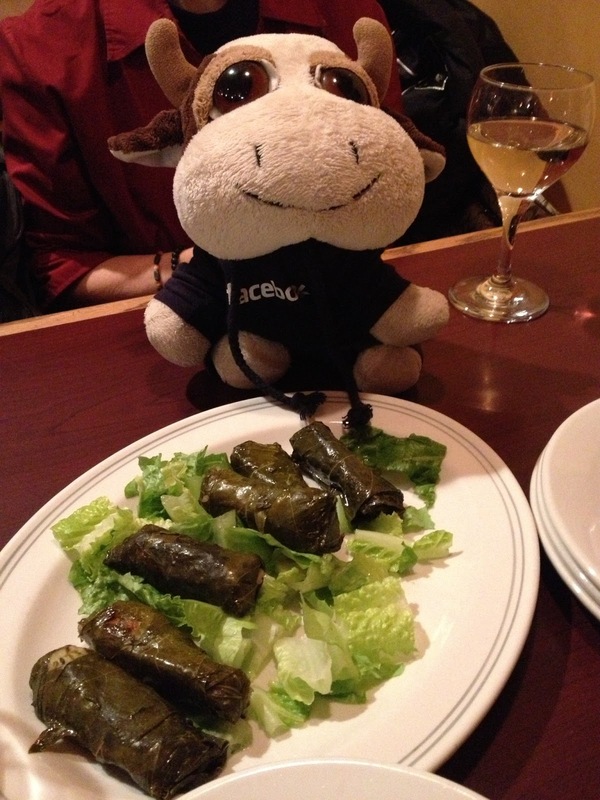 We all found the grape leaves too thick, often the filling would fall out by the time we managed to gnaw our way through the leaf, while the stuffing inside was a bit on the salty side. 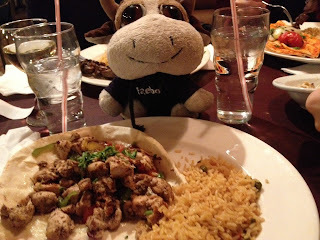 Our entrees faired about as well as the appetizers. 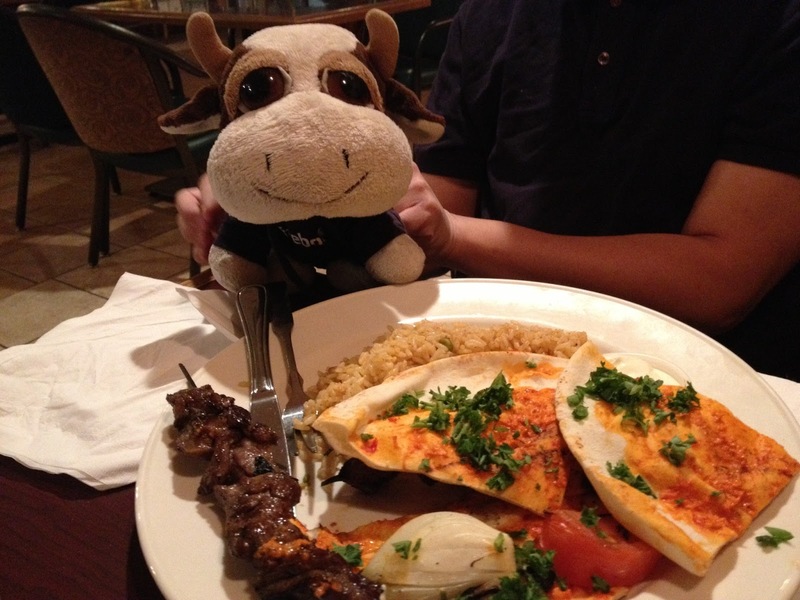 The lamb kabob was very tender and had a slight char taste to it. However the chicken on the chicken shawarma platter was very dry and tough, and the humans found the feeb from the feeb shawarma tough and difficult to chew. As well, the lemon in the sauce on the feeb was overpowering any other spices that it might have been marinated with. Overall with only two decent dishes out of six, we weren’t impressed with either the food or the service. Considering the number of Mediterranean restaurants there are to choose from in Edmonton, it’s unlikely that Co Co Di will be one that we would return to.